Summer is over and you’re going back to school. With the start of the new school year, you get a brand new group of students; and with that comes a brand new set of names and faces to remember. 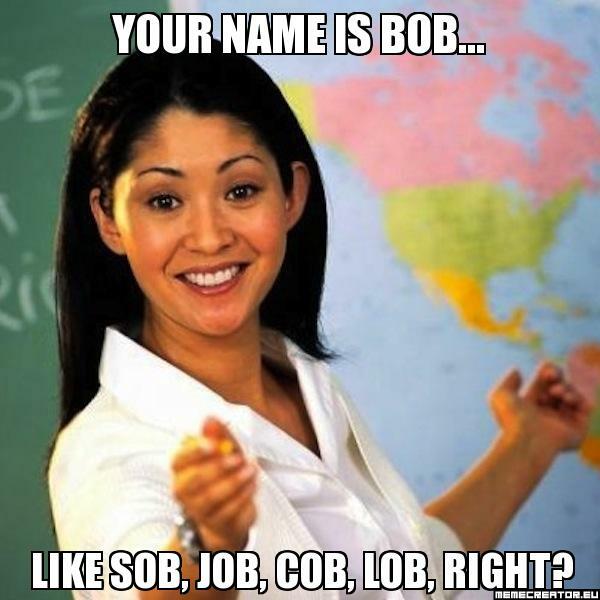 Remembering a name is never an easy task and that goes double for teachers. Not only do you have to memorize more names than most people; but there is also a greater expectation of you to get it right the first time. Forgetting a student’s name is the surest way to make them think that you don’t care about them. Humans remember things more easily if they are spoken aloud and this is especially true when it comes to names. A mind is a muddled place, and lots of things get lost up there. The surest way to keep that from happening is repeating your student’s name in conversation as often as would seem normal. For example: Pretend it’s the first day of school. As you do roll call, and as the student responds, say something like “Thank you Mark (or whatever the student’s name is), it’s very nice to have you here” Or if a student should raise their hand, you would respond with their name and once they give their question you would say something like “Well Cindy the reason is…” By constantly using their names, you are building the habit of memory. Remembering a name becomes easier to remember when you attach it to something. If I know Donny has a Dalmatian, and Suzy love science; their names will stick out better in my mind when I’m speaking to them. 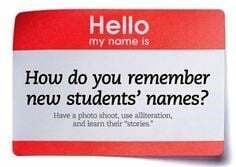 Try having your students introduce themselves and tell the class one interesting fact about themselves. The exercise will not only help the class learn more about each other, but you’ll have things to associate every student with. Some teachers like to use a seating chart for the first few days, but as the semester drags on they become more lenient about where their students sit. While that is not necessarily a bad thing, it will really wreak havoc on your memorization skills. Was it Anna or Alicia in the fourth row? No matter how you develop your seating chart; stick with it. Nothing helps your memorization better than have a set chart that you can look at every day; not to mention it makes a great cheat sheet if you find yourself forgetting a name! Our brain works better when put to use. Much like verbally repeating a name, spelling out a name helps imprint your memory with the student’s name. Whenever you call on your student, mentally spell out their name. If you’re having trouble with, imagine the name written on a board or you can simply look at the name on the roll while you’re mentally spelling it out. What matters most is the repetition and effort. Keep practicing and you’ll have their names cataloged in your brain in no time! One of the reasons it’s hard to remember a person’s name is that sometimes we simply just don’t care. Every day we meet hundreds of strangers, acquaintances, and friends; it’s very hard to keep up with everyone. Unfortunately for you as an educator, that is not an option. The best thing you can do to remember your student’s name is to actually care. It is so easy to become jaded and see your students as just the next crop of brains to tend, but you have to remember that these are little human beings with hopes and dreams as well. The more you care, the easier it will become. Being a teacher is never easy and keeping track of 80 different faces, lives, and names doesn’t make it any easier. However, with a little care and practice, that task can become easier than it was before.